Deposit checks and currency directly into your account 24/7. To apply, complete the debit card application form and return to one of our Bank 1st locations. Debit Cards have a $750.00 daily limit (i.e. POS transactions, ATM withdrawals, etc.) of which $200.00 can be cash. This limit resets daily at midnight. 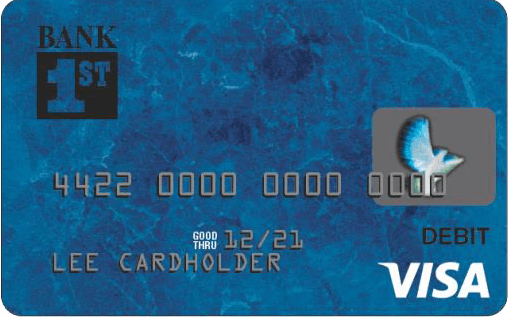 For further questions about your debit card limit, contact a Bank 1st employee. Deposits made, via your Bank 1st debit card, before 3:00 p.m. on business days will receive same day credit. Your card’s account balance will be updated three times every day, around 8:00am, 11:00am and 4:30 pm. A small fee will be assessed annually for each Bank 1st debit card, unless attached to an E-checking account. NOTE: This fee is per account and includes up to two cards. Debit cards can be replaced by contacting the bank to reorder a new card. Unless the card is replaced due to expiration, a replacement card fee will be assessed. Your debit card will expire every three years. A new card will automatically be mailed to you the month prior to your card’s expiration date. Bank 1st strongly encourages you to monitor your account frequently and keep track of your debit card transactions. Unauthorized transactions should be reported to the bank immediately by contacting the bank at 563-422-3883. Shazam, our debit card processor, may place a temporary block on your debit card transactions if fraud is suspected. Please ensure that Bank 1st has your current phone number as an attempt, via phone, will be made to contact you concerning these transactions. If you need assistance outside of bank hours, please contact Shazam at 866-508-2693 (available 24 hours a day). Your Bank 1st debit card can be used both domestically and abroad. Please ensure when traveling that you notify Bank 1st before your departure to prevent your card from being erroneously blocked. Please call Bank 1st at 563-422-3883 to report any lost/stolen cards immediately. If you need assistance outside of bank hours, please contact Shazam at 800-383-8000 (available 24 hours a day). Bank 1st is required to participate in Visa Account Updater (VAU) services. VAU extends the amount of time your account-on-file information (i.e. account number and expiration date) is stored with your selected merchants by automatically updating your debit card information due to account changes, like the expiration date. If you’d prefer not to have your card information updated automatically with participating merchants, you can opt out by contacting the bank to sign an opt-out notice.